We Are Riverside’s #1 choice for fence building since 1978. All Counties Fence and Supply is one of the best fence contractor companies in Riverside for over 30 years. Since 1978 we have been building all types of fences across Riverside county. We buy fence materials directly from lumber mills and pass the savings on to you. We sell and install all types of fences, whether it’s wood, vinyl, iron, chain link – even automatic gates – we offer it all. In addition to building fences, we install decks, create horse corrals, install glass walls, and more. Our experienced contractors ensure that you are only given the highest quality and that they are installed perfectly. We have a general contractor license, making us the ideal company for your fencing, landscaping, and hardscaping needs. All of our fence products and installations are backed by product and labor warranties, along with our guaranteed customer satisfaction. Stop in at our retail showroom to learn more about the fence products and services we offer or contact us for a free quote. Below are the various fence types we offer. Traditional wood fences are a top choice for homeowners and business owners alike. The offer a classic look as well as incredible durability, and are one of the more affordable fencing options available. 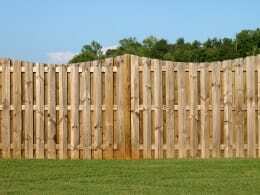 At All Counties Fence and Supply, we offer a wide range of styles including dog ear, picture frame, board on board, picket, privacy, and estate fences. We also offer a wide range of colors and finishes for your fence to ensure it provides the exact look you want. For nearly 40 years, we have been providing high quality wood fencing to Temecula, Murrieta, and the surrounding areas. Vinyl fences are amongst the most attractive, versatile, and dependable types of fences on the market. Vinyl fences are available in a variety of style including gapless and privacy fences. In addition to their wide style options, vinyl fences are easy to maintain and clean, and are incredibly durable. From Inland Empire and the surrounding areas, commercial and residential property owners opt for vinyl fencing from All Counties Fence and Supply. Iron fences are the best choice when you are looking for a clean, sleek, and durable fence. These fences offer both elegance and endurance, making them a timeless choice all around. At All Counties Fence and Supply, we use premiere galvanized steel for all of our tubular fences. 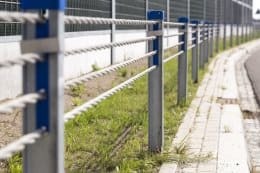 Galvanized steel on fences is ideal for applying paint or powder coating to achieve the look you want; all you need to do is prepare the fence with a layer of primer. Galvanized steel is also very durable, ensuring they will retain their color and integrity for years. In Riverside and San Bernardino Counties, home and business owners have relied on the fence contractors at All Counties Fence and Supply for iron fences for 40 years to keep their property both beautiful and secure. One of the most popular style of fences is chain link fencing. 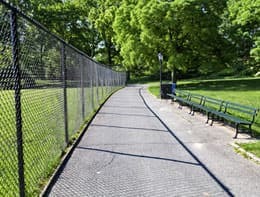 Compared to other fencing materials, chain link fences are incredibly affordable, and it provides incredible function. We offer multiple styles of chain link fencing to help you get the look you want. 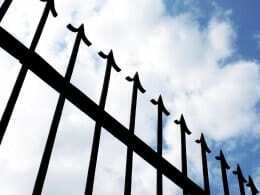 Uses for chain link fences include per enclosures, tennis courts, general privacy, and more. Whether you are a homeowner or looking to make improvements to your place of business, we can help. Use our chain link fence products to help protect your property. Although traditional fences offer a lot of aesthetic and functional benefits, they can block your view when you don’t want them to. When you need a fence for your home or business, but do not want to block your customer’s view, glass wall fences are the best option. These fences create barriers without obstructing views and also help to cut down on noise pollution. Many of our clients use glass wall fences as wind walls and pool enclosures that are both aesthetically pleasing, and help to keep their pets and families safe. Here at All Counties Fence and Supply, our fence contractors we can create the perfect glass wall fence for you. When you need a fence that doesn’t block the view at your home or business, but a glass wall fence is not an option, cable fences might be. 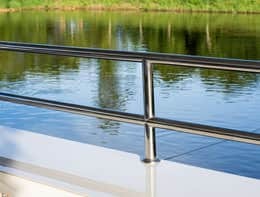 Theses fences create railings that offer safety while still looking sleek and attractive. Cable fences are minimalistic and are a great fencing choice for decks, patios, and stairways. Lodge pole and pipe rail fences are a cost-effective fence usually used for creating enclosures for livestock on farms and ranches. However, you do not need to have a herd of animals to use them. These fences are great for adding character to any property. Made from sturdy wood, they are designed to last a for years with minimal maintenance on your part. We offer Riverside and San Bernardino counties these fences in a number of different colors and designs. When selecting a fence, there are four things you want to consider: look, function, durability, and cost. You obviously want a fence that fits the style of your home or business, but still want to provide the functions that you want. However, the look and function of your fence are irrelevant if the product you purchase is not durable. Tie all of these things together, you want to buy a fence that provides all of these features while staying within your budget. 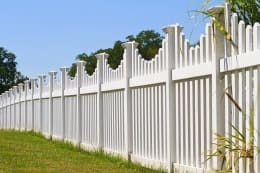 Experience the superb customer service and products thousands of satisfied customers in the Riverside and San Bernardino counties are have already come to expect with All Counties Fence and Supply. We are a one-stop shop for all your fencing needs from products to installation. With nearly four decades of industry experience, you can count on our fence contractors to deliver the fences you want for your home or business. Stop by our showroom or contact us today for your free estimate.